Well, after 7 years of absence, it is time to restart my Io website. This is actually the site's third incarnation. The first I started almost 10 years ago. The second I started up on Fortunecity in 1999. You actually still visit that website at http://volcanopele.fortunecity.com/. Unfortuately, Fortunecity's file storage capacity decreased to the point where for some reason, I got locked out of the account, but the website remained online. Then college happened. In 2004, I started working on the Cassini mission, currently in orbit around Saturn nowhere near Jupiter and Io. Early last year, my attention returned to Io thanks to New Horizons. I became interested in what had happened on Io since Galileo last looked at it in October 2001 before crashing into Jupiter in September 2003. After posting some analysis of the New Horizons LORRI images on the Unmannedspaceflight.com website, I was privileged to be a co-author on the Science magazine paper on the New Horizons results at Io. Also the year before, I co-wrote a review chapter for Rosaly Lopes and John Spencer's book Io After Galileo on that probe's mission at Io. 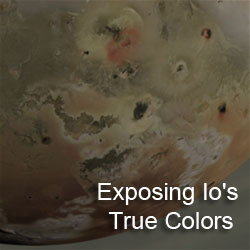 So over the last year, in my spare time, I've been drawn back to Io: reprocessing Galileo and Voyager images, working with the New Horizons images, and editing the Wikipedia article on Io. Now, a blog. 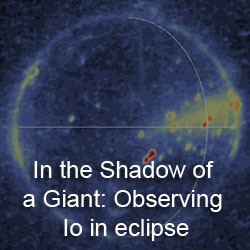 Wait, a blog about Jupiter's Moon Io? But there isn't a spacecraft within 100 million km of it! True, but that doesn't mean that there is no news, new images, or potential discussion points about everyone's favorite moon. I plan on reporting on papers and abstracts that are released and explaining some of these new results. I will post some of my reprocessed images that I've been working on. If any readers are amateur astrophotographers (or professional, I'm not discriminatory), and you have some nice Jupiter-Io shots to share, pass them along. 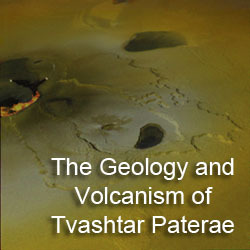 Got some new volcano news you like to share, I would love to hear it. Obviously, since news is not being generated daily about Io, there will some off-topic posts, like movies I am enjoying at the moment or the latest Europa news to annoy me (hey, wanna be creative and make some nice anti-Europan propaganda posters, pass them along). Obviously, as a new blog, we'll see how this goes.